It may seem strange that bees and Lumberjacks go together but there is a “relationship” bees are our pollinators and without them we won’t have trees; and it is a common problem to find trees in the back yard that have bees in them. 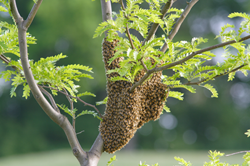 Swarms usually hang off a branch for as little as 1 hour and sometimes for 3 or 4 days; but as soon as they find a place warm and dry . . . they move! And if that happens to be the roof of your house, then it is a lot harder to get rid of them – Act Quickly! Nakara and Covering all areas.